Target is removing a T-shirt from its stores after an Oregon woman claimed it was copied from one of her own designs that she sells on Etsy and through her website. The tank top is black with white stripes of the American flag with the words "#MERICA" in the corner in place of the stars. The controversy got picked up by a local news station in Oregon as well as the Today show and has been making the rounds on social media. Joshua Thomas, a Target spokesman, said in a statement that Target has a "deep appreciation for design" and so was concerned when this was brought to the Minneapolis-based retailer's attention. "We've been in contact with the vendor that produced this tee," he said. "We've also reached out directly to the designer." He added that the shirt was not produced by one of Target's in-house private-label brands, but by an outside vendor. 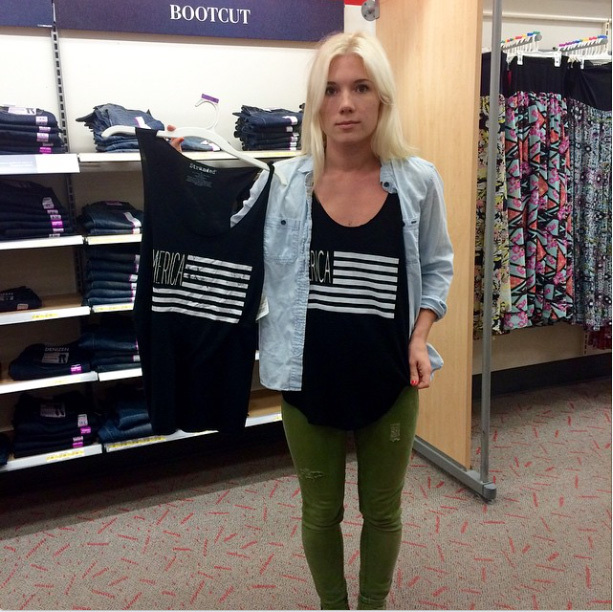 On Monday, Melissa Lay, the designer behind SandiLake Clothing who lives outside of Portland, Ore., posted a picture to Instagram showing her wearing her own T-shirt while holding up Target's shirt inside one of its stores. "Naturally, I was shocked, confused, and frustrated when I discovered one of SandiLake's first five original designs available for sale in Target without my prior knowledge," she wrote on her company's blog, where she shows the two shirts. "Side by side, their tank completely matches our design, color scheme, and font." She added that this design was her most popular and was created last year for the 4th of July. She said when she called to complain to Target, she was put on hold for 45 minutes and then was given a mailing address to send in a complaint. "They're using a stolen design, but they have the backing of large company dollars and the little guys like us don't stand a chance," she added. "It's frustrating and it's not ok."
Lay did not immediately respond to a request for comment about Target's decision to remove the shirts from its stores. Rare sale: Up to 70% off BT McElrath artisan chocolate through Sat.